Ambassador of Americana, Charles Phoenix, takes you back in time to the granddaddy of all theme parks when it was new. 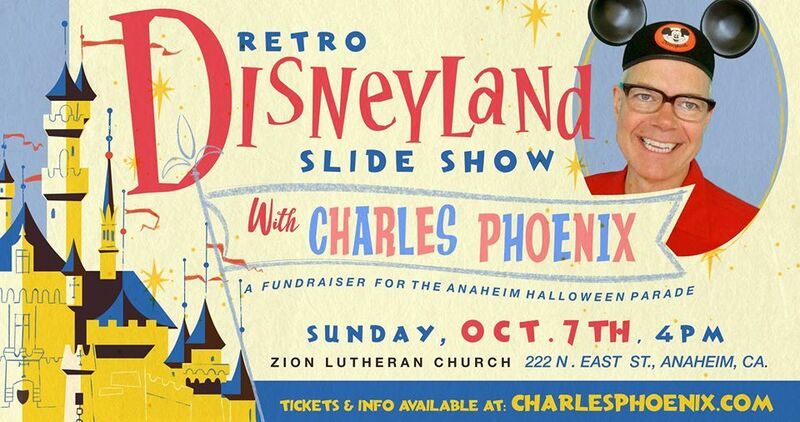 Projecting his unbridled enthusiasm, keen expertise, and spectacular collection of mid-century era Kodachrome slides, Charles shares the backstories and glories of the early days of Main Street USA, Adventureland, Fantasyland, Frontierland and Tomorrowland. See long-gone attractions including the Phantom Boats, Flying Saucers, Indian Village, Stage Coaches, People Mover, Carousel of Progress and more. Experience the original Tomorrowland when it was promoted as The World of 1986, and the all-new Tomorrowland in 1967. Charles also shares the flaming back story of the monorail, takes you inside the ultra space-age, House of the Future and flies you to the moon in the legendary TWA Rocket. In addition to all the Disneyland delights, tour Freedomland USA, the ill-fated Disneyland-wannabe theme park that opened in New York City in 1960, plus over-the-top Disneyland area themed-motels and more! This is your time-travel trip to the gold standard of all theme parks, when it was new! You will never experience Disneyland the same way again! Your imagination will be inspired and your spirit will soar!